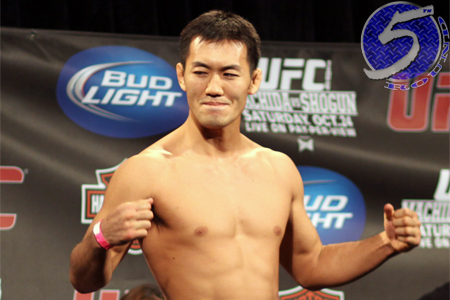 A middleweight scrap between Yushin Okami (Pictured) and Buddy Roberts was the second fight to air live in Saturday’s “UFC 150: Henderson vs. Edgar II” pay-per-view broadcast. Roberts comes out firing, and he’s landing quite a few strikes. Not a bad start for a 4.5-to-1 underdog. Okami eats a left hook and appears wobbly. Okami gets a body lock and has him clinched against the cage. He finally drags Roberts to the mat. Okami transitions to side control. He moves to full mount, now takes his back. Okami was bringing the pain, but Roberts managed to survive the onslaught. Roberts lands a solid left hand. Okami counters with a left of his own. He takes Roberts to the canvas for a moment and almost got caught in a guillotine choke on the way down. Okami easily moves to full mount. Roberts gives up his back and the former top contender has over two minutest to punish him. After countless unanswered punches to the dome, referee Herb Dean decides to bring the violence to an end.